Food that will make your skin glow! Protein, Vitamin E, Vitamin C, Iron, Vitamin A based foods. Elders often say that your internal wellness reflects externally on your skin. How true! When your body is properly hydrated and gets all the nutrients it requires, then the benefits glow on your skin too! An array of ingredients ranging from fruits and vegetables to nuts and sprouts, are all foods which can be termed as ‘living foods’ for radiant skin. Each nutrient in a well-balanced diet plays an essential role in keeping the skin healthy and youthful. 1. Protein has the major tasks of building and maintaining the skin cells. Certain types of protein are, in fact, part of the outer skin layer, providing support and elasticity to the skin. Turn to sprouts as a good source of vegetarian protein. 2. Iron helps to ensure a proper supply of blood, oxygen and other nutrients required for the maintenance of the skin cells. Stock on your supply of greens. 3. If the skin is protected from getting dry, it is thanks mainly to Vitamin A and other antioxidants like lutein (tomatoes and kale). 4. Performing a similar function is the group of vitamin B-Complex, which also prevents the appearance of brown spots, mainly on the face, forearms and legs. 5. Vitamin C assists in retaining the freshness of the skin and making it glow. Fruits and veggies like orange, capsicum, cabbage, sweet lime, pineapple etc are good sources of this vitamin. 6. Vitamin E uses its antioxidant properties to prevent the skin from getting discoloured and wrinkling. Get it from walnuts – the best vegetarian source for vitamin E.
7. The minerals Calcium and Zinc help to protect the skin and keep it healthy. However to some dairy products may cause skin concerns, then they are best avoided. 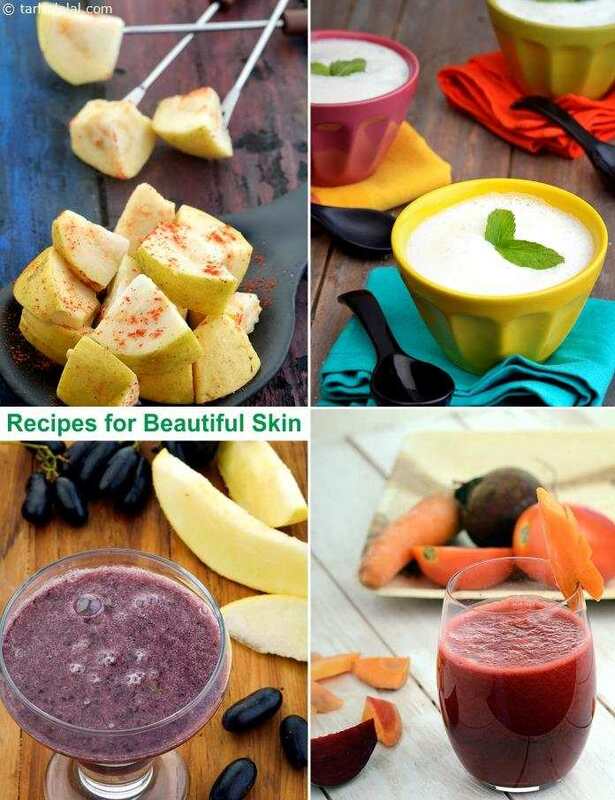 Dig into this array of delicious recipes, which will help you maintain glowing and healthy skin, and as a result feel young and fit forever. Bean Sprouts and Vegetable Salad, Carrot and Red Pepper Juice, Spinach Orange and Beetroot Juice, Nourishing Lettuce Soup, Rajma and Spinach Wrap etc. are a few skin friendly recipes you will find inside this section. Most of the recipes involve little or no cooking, to retain all the nutrients required for healthy and radiant skin. Scrumptious and tasty, these skin-friendly recipes are also a delight to bite into.